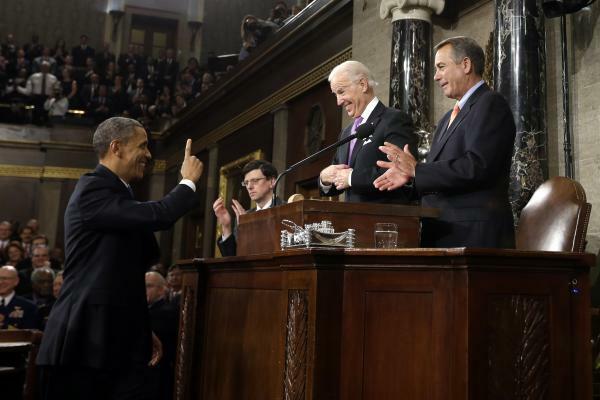 President Obama gestures to Vice President Joe Biden and House Speaker John Boehner before giving his 2013 State of the Union address. As President Obama prepares to deliver his State of the Union speech Tuesday evening, he does it against a backdrop of some of the lowest voter-approval ratings of his presidency, with a divided Congress that has largely stalled his second-term agenda and with Washington's collective focus starting to shift toward the midterm elections and beyond. Income inequality -- Obama has made the populist issue of the ever-growing income gap between the superrich and everyone else the overarching theme of his second term. So this message will get major minutes Tuesday — especially since Democrats see it as helpful to their goal of keeping the Senate. Democrats have pushed for two congressional actions they say would help struggling Americans in the near term — increasing the minimum wage and further extending long-term jobless benefits. Republicans have resisted both policies. Expect the president to argue that Congress needs to move forward on both and soon. Meanwhile, the president is likely to talk about the actions he can take on his own, like his recently announced Promise Zones initiative to ease some federal rules to encourage job creation in low-income communities. Congress-tested themes -- Michael Waldman, who directed former President Clinton's speechwriting shop, expects that Obama's speech will have the same road-tested quality SOTUs typically have. Presidents who hope to get anything done with Congress try to avoid surprises. "A State of the Union speech, whether something goes in the speech or not, is not just about what sounds good to the audience, but political choices like, 'If we do that, it might make it harder to pass what we want,' " said Waldman, who's now president of the Brennan Center for Justice at New York University. "It's a negotiation with Congress often about what goes in the speech. Clinton used to talk with [Speaker Newt] Gingrich all the time about what would be in the speech." Immigration — This will provide a chance for the president to talk up the bipartisan possibilities that 2014 could bring. House Speaker John Boehner has raised the idea of a Republican approach to overhauling the nation's immigration laws instead of the comprehensive bill that passed the Senate and which Obama supports. Despite those differences, with both Democrats and many Republicans eager to do something on immigration this year, this could be one of the rare moments where we see applause on both sides of the aisle. But expect the president to proceed with care, says Waldman, who assumes the president really wants a new immigration law passed this year. The president has to "raise the temperature" enough to show he's willing to spend whatever political capital he has left on getting it done — and enough so that if it doesn't happen, blame can be more easily affixed on Republicans. Yet he can't raise the heat so high as to drive away too many of the House Republicans who will be needed for passage. Obama recently changed his White House team on Capitol Hill in order to improve his chances of threading the needle. Affordable Care Act -- In past SOTU speeches, the president hasn't mentioned the "Affordable Care Act" by name. But with the worst of the fiasco of the federal HealthCare.gov website rollout behind him and the need to sign up as many young "invincibles" as possible for the economics underlying the law to work, Obama can be expected to make a pitch to those who haven't signed up for coverage: Do it soon. Afghanistan and Iran -- Foreign policy and national security typically get much less time than domestic affairs in the SOTU. But that doesn't diminish the importance of what the president will say on those issues. U.S. troops will end the nation's 13-year military odyssey in Afghanistan this year, something Obama will no doubt remind his audience of. He'll note that he's the president who ended two wars — the other in Iraq — that he inherited. Iran is trickier, though. The president wants Congress to avoid imposing new sanctions that could throttle current negotiations. It's another issue on which he will need to tread carefully.